We are on the road at least six months or more each year. We stopover, on average, at thirty campgrounds each year. Each campground is different when it comes to sewers. Some places only have dump stations. 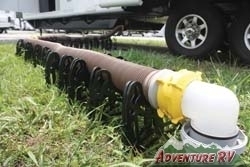 Some Parks have sewer ports either uphill from your connection, or the pvc pipe may be several inches above the ground, or more often than we like, it's an unreasonable distance from the RV. 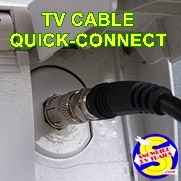 This has necessitated that we carry extra sections of the 4" hose and various connectors that would fit any situation we ran into. This assortment was all carried in a large plastic tub with a cover that took up a LOT of space in our basement compartment. We started researching the macerators that were on the market. 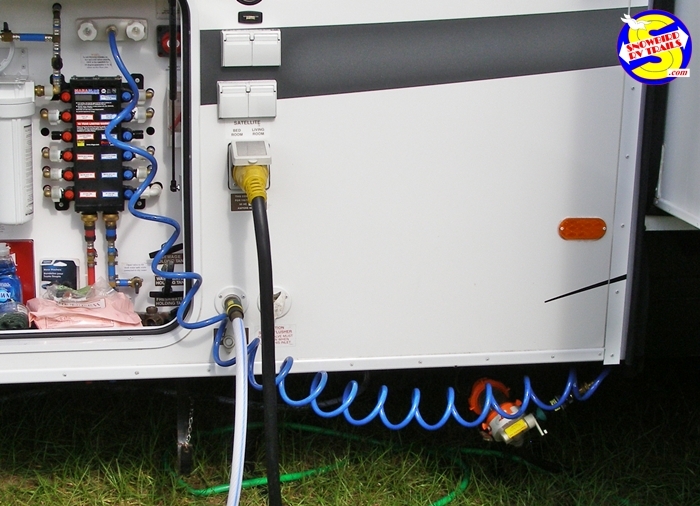 There are a couple of different types requiring connections to the RV's 12 volt system. Our research led us to "The Sewer Solution" pictured here. It requires no electrical connection and runs totally by water power. The campground's water pressure is routed through a small nozzle with sufficient force to shred any material coming from the black tank (providing it is the normal "byproducts" and single ply toilet tissue recommended for black tanks. No foreign objects please!). Yes, we were skeptical from the beginning though the reviews we found raved about the product and the good job it did. The reviews convinced us to buy it and try it. We did and it does! We connected the pump to a clear, 45 degree swivel connection for monitoring purposes. It works as advertised, will pump uphill, and it backflushes the black tank and cleans itself after use. Plus you have much less of a storage and hygiene problem! Start the garden hose and open the RV gate valve. 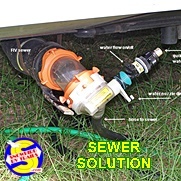 Sewage passes thru the RV sewer pipe and gate valve into the SewerSolution. The patented Jet Pump will shred and pump waste thru the Discharge Hose. 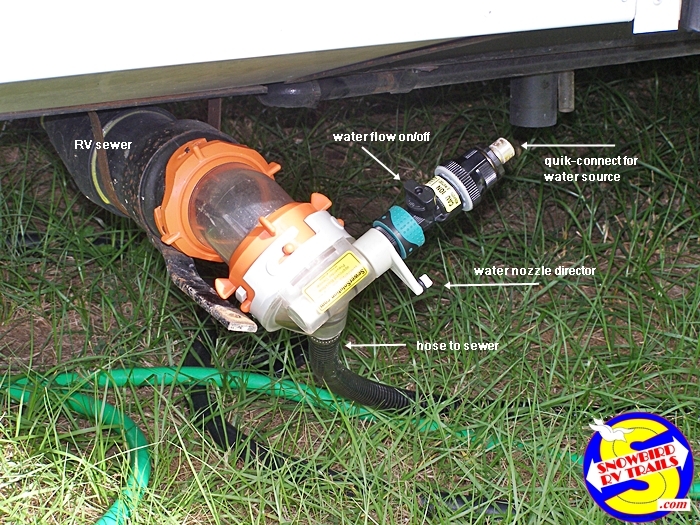 Close the RV gate valve and rinse everything downstream of the gate valve with high pressure, clean water. The RV sewer pipe, SewerSolution pump and the Discharge Hose are completely cleaned! You will finish the job clean and begin clean the next time! It’s that easy and no more old style, bulky hoses. We purchased the extra 10' extension hose along with the unit. 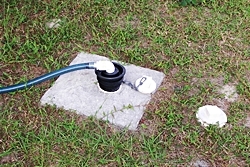 (with back-flush: preventer) connected to the SewerSolution. 08/2016 - After using the Sewer Solution for nearly three years it deserves some follow-up observations. 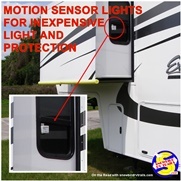 We have used it at 60+ campgrounds since installing it and have had no problems. I would suggest you buy the 10' extension hose so that you have 20' of discharge hose for those sewer pipes that end up behind your rig rather than beside it. We use only the Scott single-ply "Extra Soft" toilet tissue and nothing goes down the toilet that is not biodegradable. We've had no clogs whatsoever even when we shut the watersource off and let gravity drain the tank for a short period. We do carry a 10' section of slinky for emergency use at dump stations when needed but no such problems exist with standard campsite sewer hook-ups (even those where you have to pump uphill into those elevated sewer pipes). There is some talk of the tabs or nubs breaking at the point the SS is connected to your rig's sewer pipe. To alleviate any possibility of that happening from repetitive connections - install a clear 45 degree swivel fitting (clear elbow) to remain permanently attached to the SS side and you will have no problem. The clear elbow also lets you see when the tank is flushing clean and you have clear water coming through. After three years we would recommend it to anyone and we would not trade it to go back to the old system. 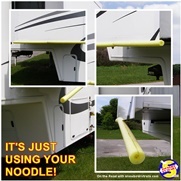 Finally, you can order end caps online that will close both ends of the SS making it leak proof and much less messy for rollup and travel. We coil it, put it in a bag and carry it weighed down by our electric cord in the bed of the truck. You can purchase Sewer Solution through Camping World but Amazon does seem to have the better price. It has worked like a charm for us and no electrical connections needed!